This is the tale of how I launched LinksSpy.com. I wrote it both to get a few thoughts off my mind and to give a counterpoint to articles like this one from RivalFox. I don’t want to be negative about RivalFox’s achievement: Those guys rock and they deserve every last bit of it! – I just want to add another data point. tl;dr: I did a few things right, I did quite a few more things wrong, but in the end I shipped and had moderate success so far. LinksSpy allows you to spy on your competition and learn where they get their links from. This helps you to build more high-quality links to your website – thereby sending you more visitors and helps you get ahead of your competition on Google. It is targeted mostly at SEO agencies, who use it to optimize their clients’ websites. I came up with the idea while working with the beautiful people at Moz – who were kind enough to take me on as an intern despite serious legal obstacles (Short story: I could only work unpaid because I already get paid, they wanted to pay me for legal reasons). So I felt that I had to give something back and I came up with an idea to lower their churn rate. That idea eventually evolved into LinksSpy. I built LinksSpy on the side. My day job doesn’t leave me with a lot of room, but I usually manage to sneak in about 10 hours of work each week. For the techies: LinksSpy is built with Rails and runs on Heroku. I started working on the LinksSpy-predecessor around this time last year. It was a clunky shell script written in node.js. It was designed as a one-off project – to be run only once as a test to see whether it would reduce churn or not. After I was back to Germany from working in Seattle, I didn’t put much work into the script; mainly adapting it to work with the free tier of the Moz API. 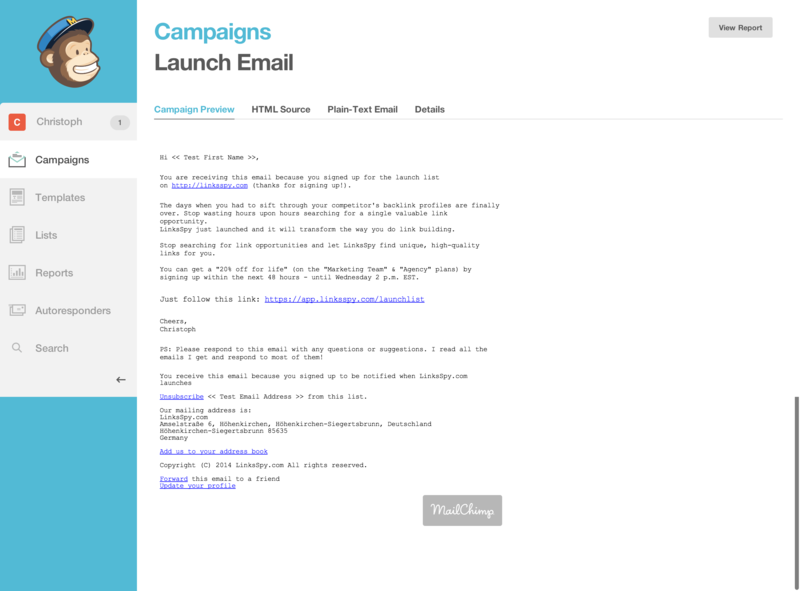 However, I put up a basic landing page and started collecting email addresses. I also bought my way into betali.st, which got me 226 addresses for a modest $39 (at a 41.4% conversion rate). The addresses were of pretty good quality, too. Up to the launch I mainly focused on building a web app to present the data and talking to potential customers from my growing mailing list. I scanned through my list using Rapportive – which allows you to find people in your target niche. At various stages I onboarded two or three users at a time to beta test LinksSpy – making very clear that while usage is free during beta, I would eventually charge them. The script would query the API and compute everything in a single run. Often it would crash two or three times before running successfully – I had to restart it every time and hope for the best. I implemented a lot of feedback from my beta testers (Thanks again, guys!) over the following months – along with credit card processing (using Stripe & Koudoku) and a feature to do outreach. After about eight months of development, I finally got fed up with postponing the launch again and again and again. I pulled the trigger and announced the upcoming launch to my mailing list of 268 subscribers on 24.04.2014. That converted 10 out of 268 people to paying customers – a 3.7% conversion rate. This does not seem too bad, considering I had no free trial. I think that went pretty well – I could have warmed up my email list a bit more, but overall I am pleased with this part. First lets talk about pricing. I launched with a 3-tier pricing of $10/20/40 – which includes the 20% discount mentioned in the emails. Two days after the launch I increased prices to $10/25/50. Prices have remained at that level for the past two months. When I launched LinksSpy there wasn’t a free trial – and there isn’t one up to this day. This was a bit of swimming against the stream and I got some negative feedback about this – despite a 60-day money back guarantee. I was craving the ultimate validation for my product: People were actually willing to pay for LinksSpy. To that end it worked beautifully and I got 10 paying customers for a total monthly recurring revenue (MRR) of $190. In hindsight I believe that it would have been wise to offer a free trial. If nothing else, it would allow me to collect email addresses, improve onboarding and learn faster. I also got the feedback from a few people that I am not charging enough. I’ve probably told a dozen people that they should charge more – and here I am charging too low for my own product. That is a special kind of stupid. I am going to change both shortcomings in the upcoming weeks. Together with introducing a 7-day trial I will raise prices to $19/$49/$99. Having the trial be that short is quite unusual, but users get value out of LinksSpy almost immediately after sign up. That’s why I’ll have a real short trial first and maybe test a longer (14 or 21 days) trial later. About two (2!!!) hours before launch I decided that it would be a really wise idea to make this little (8 characters!) change to the source. What could possibly go wrong? Well…. a whole lot of things could go wrong. You could corrupt your data model and show your newly-found customers a (not so nice, default Rails) error page. Things like that. It took me about 2 hours to put that wrong to right – and about a dozen emails to apologize to everyone affected by it. Lesson learned: Don’t be an idiot, keep your hands away from the code and where I can see them 48 hours before the launch. NO consistent design for the marketing website & application. The marketing website / blog is based on WordPress and the Genesis theme – the application and the main landing page are designed using Bootstrap. I could find more things to go on the list, but what’s important is that LinksSpy was far from perfect when I launched it. Still, I got happy paying customers. None except announcing it to the mailing list. Despite me knowing that this is the worst possible move, I didn’t put any marketing effort into LinksSpy. I wanted to keep quiet about it, get some paying customers and see how well it would work out. LinksSpy had $255 MRR – coming from 15 customers – on 01.07.2014 (about two months after launch). I have seen three people cancel their accounts, which means about 15% churn rate – which is to be expected for a newly launched product. All those numbers should be taken with a grain of salt, because my numbers are still so low. As my goal is to be able to live off LinksSpy’s revenue in 2022 (no kidding there; that really is my goal) at the current growth rate I will be at about $3500 by then :-D. Not quite enough yet, but not too far off either. 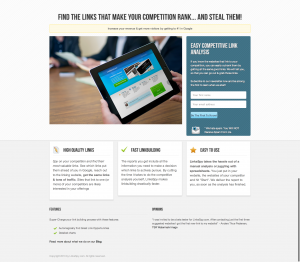 LinksSpy is aimed at SEO agencies, but so far I didn’t convince many agencies to sign up. Most of the customers so far are SMBs and quite a few people who I know personally. I need to focus more on marketing to SEO professionals. I will do so by being more active (and buying ads) on /r/seo, /r/linkbuilding and other watering holes for SEOs. I’d like to think that I have made considerable improvements to LinksSpy, but I still feel like I need to do much more. That’s probably normal, though. completely re-wrote the backend; replaced the node.js script with Ruby and fully automated it. This decreased the turn-around time from 24-48 hours to < 2-4 hours. This is a great win for my customers as they get their data faster. a bunch of minor features like filters for suggestions, better export functionality etc. I have slowly started to ramp up my marketing. I check reddit for topics where I can contribute to the discussion and mention LinksSpy when appropriate. Most importantly, I started with building content on the LinksSpy blog. I hired a guy through oDesk who writes rather long (1,000 words) articles for the blog (examples here and here. He’s got a bit of an audience, which is a great benefit on top of his well written articles. Additionally, I started tagging people for remarketing with PerfectAudience and AdRoll about a month ago. 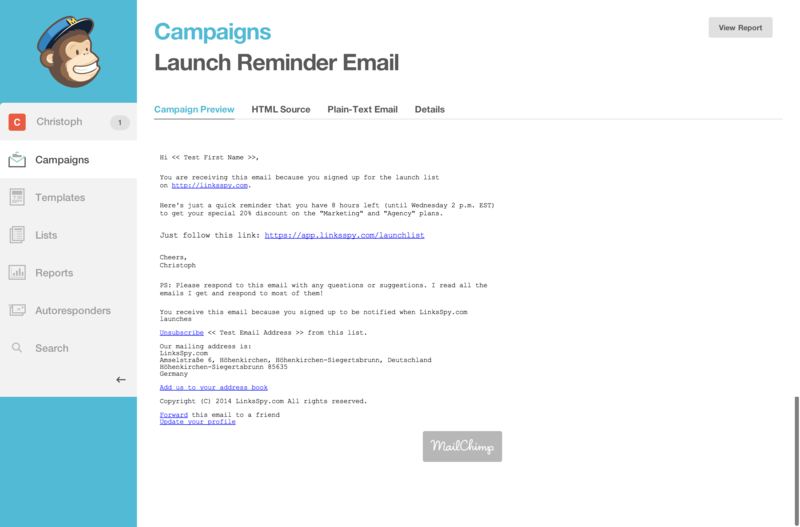 My plan is to use remarketing to get people to sign up for a drip email campaign. I have written 3 out of 5 planned emails so far. I’ve got the banners for it and I’m tagging the people. All that is missing are the last two emails before I can start with remarketing. 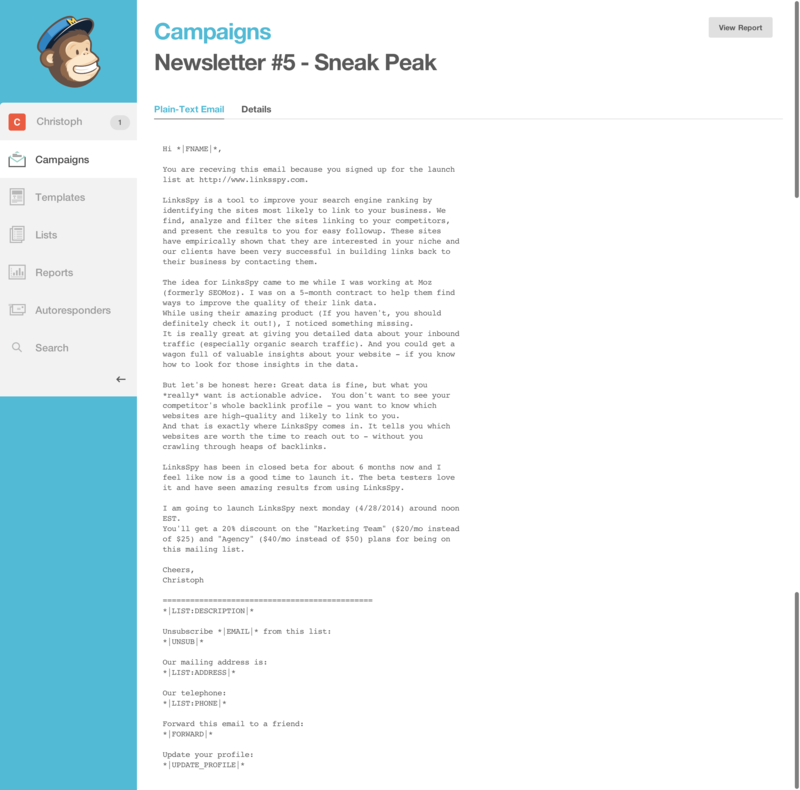 Once I have the drip email campaign and remarketing in place, I want to focus more on getting visitors to the page. Before having that it would be like carrying water in a sieve. I have learned quite a bit: Some things went well, others not so well. Have an email list and keep it warm. I partially failed at keeping it warm. I only sent 4 emails over the course of 5 months prior to launch. That’s the hardest part here: Do I have enough numbers to come to any meaningful conclusions? Maybe, maybe not. What I can say so far is this: It is NOT easy. I haven’t even reached product-market fit and the way there is blurry and uncertain to me. There is so much more to learn about my customers and how I can provide value to them. Was it wrong that I launched so early? I don’t think so. 10 minutes after the launch, when I learned of the severe bug, I felt like it was the worst decision ever. With two months distance from that evening, it doesn’t look that bad anymore. I got some amazing feedback, happy customers and the advice (from said customers!) to charge more. That isn’t too bad – eh?